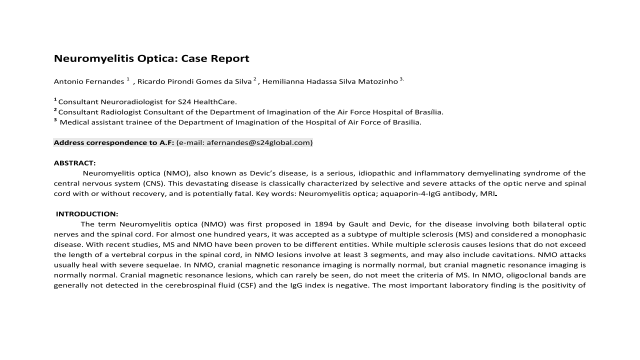 Abstract: The 28-year-old female, from Brasília, Brazil, presented in April, 2018 to the Section of Neurology at Brasília Air Force Hospital (HFAB) with no pathological history, came to the complaint with amaurosis on the sudden left that evolved from partial to total in 48 hours and persistent headache. Complaint for more than one year of paraesthesia of the upper limbs without considering that fact to seek medical assistance. After investigation including nuclear magnetic resonance (MRI) of the brain and spinal cord and laboratory findings, the positive test for anti-immunoglobulin G antibodies (AQP4-IgG). Remain in follow-up service. Summary: Neuromyelitis optica (NMO), also known as Devic’s disease, is a serious, idiopathic and inflammatory demyelinating syndrome of the central nervous system (CNS). This devastating disease is classically characterized by selective and severe attacks of the optic nerve and spinal cord with or without recovery, and is potentially fatal. Key words: Neuromyelitis optica; aquaporin-4-IgG antibody, MRI. References: 1. Argyriou AA, Makris NN. Neuromyelitis optica: a distinct demyelinating disease of the central nervus system. Acta Neurol Scand 2008; 118: 209-17. 2. Sellner J, Boggild M, Clanet M, Hintzen RQ, Illes Z, Montalban X, et al. EFNS guidelines on diagnosis and management of neuromyelitis. Eur J Neurol 2010; 17: 1019-32. 3. Pittock SJ, Lennon VA, Krecke K, Wingerchuk DM, Lucchinetti CF and Weinshenker BG. Brain abnormalities in optic neuromyelitis. Arch Neurol 2006; 63: 390-396. 4. Kim W, MS Park, Lee SH and others. Characteristic abnormalities of brain magnetic resonance in the central nervous system aquaporin- autoimmunity. Mult Scler 2010; 16: 1229-1236. 5. Bichuetti DB, Rivero RL, Oliveira DM, et al. Optic neuromyelitis: cerebral abnormalities in a Brazilian cohort. 2008; 66: 1-4.